An American climber in the Himalayas stumbles on a shipment of backpack nuclear weapons headed into Tibet for use against China. Pursued by spy agencies and other killers across Asia, North Africa, Europe and the United States, he is captured then rescued by a beautiful young woman with whom he forms a deadly liaison. They escape, are captured and escape again, death always at their heels. 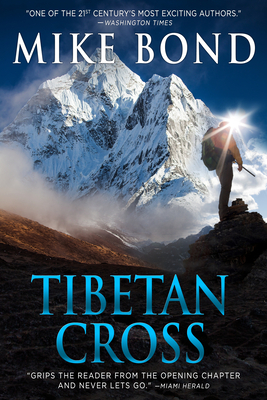 A terrifying international manhunt and stunning love story, Tibetan Cross is a European best-seller. CRITICAL PRAISE for TIBETAN CROSS: . "Intense and unforgettable." FORT LAUDERDALE SUN-SENTINEL "Grips the reader from the very first chapter until the climactic ending." UPI "Almost impossible to put down." I LOVE A MYSTERY "A tautly written study of one man's descent into living hell." SPOKANE CHRONICLE RICHMOND TIMES-DISPATCH "Murderous intensity." "A chilling story of escape and pursuit." TACOMA NEWS-TRIBUNE "An astonishing thriller." SAN FRANCISCO EXAMINER "Grips the reader from the opening chapter and never lets go." MIAMI HERALD MORE PRAISE FOR MIKE BOND "One of America's best thriller writers" CULTURE BUZZ "One of the 21st Century's most exciting authors." WASHINGTON TIMES "One of the best books of 2014." NETGALLEY REVIEWS "Bond's latest book is a must-read." YAHOO REVIEWS "Bond touches on the vast and eerie depths that lie under the thin crust of civilization and the base instinct within man to survive." NOTTINGHAM OBSERVER "A highly distinctive writer." LIVERPOOL DAILY POST "Bond is the master of the existential thriller." BBC AUTHOR BIO: Bestselling novelist, war and human rights correspondent and environmental activist, Mike Bond has lived and worked in many dangerous, remote and war-torn regions of the world. His critically acclaimed novels depict the innate hunger of the human heart for good, the intense joys of love, the terror and fury of battle, the sinister conspiracies of dictators, corporations and politicians, and the beauty of the vanishing natural world. www.MikeBondBooks.com Mandevilla Press "ONE OF THE 21 ST CENTURY'S MOST EXCITING AUTHORS." --Washington Times.